So, this is on the shelves right now. 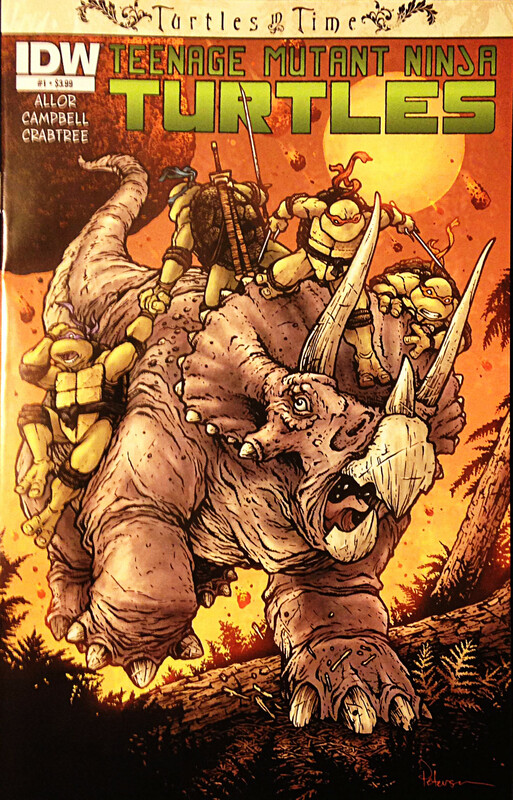 Underage anthropomorphic martial chelonian cargo notwithstanding, the Triceratops on the cover is pretty standard. The one on the inside is much less so. Or, at least it would have been up until a couple of years ago. Apparently, dinos that are All-Yesterdays-ed out are a pop culture Thing now. I’m quite taken with this decidedly un-shrink-wrapped T. rex. But then I would be, wouldn’t I? He’s a big guy with a beard who’s interested in turtles–he’s about one spatial dimension away from being me. 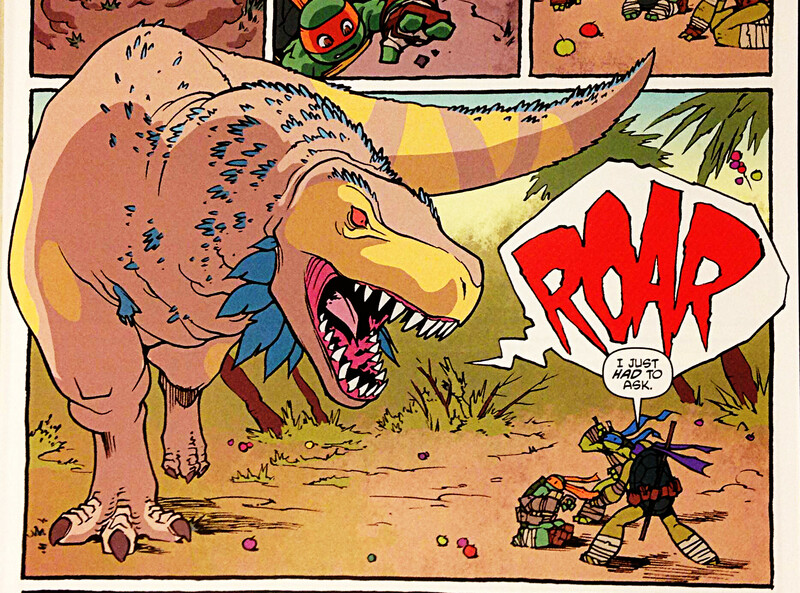 So anyway, if you dig on dinos, you might want to pick this one up. Kudos to cover artist David Petersen for rocking it old school, and to interior artist Ross Campbell for going next-gen. Immediate Update: Arf, about 60 seconds after hitting “publish”, I realized that those rascals at Love in the Time of Chasmosaurs had gotten here first. Go read their much better post, and then kiss your productive time away as you get sucked into whatever cool stuff they’ve been posting on lately. Seriously, be careful over there. Wow, check out these previews from the new Flesh in 2000AD — you’ll need to click the “Show spoiler” button. Excellent rebbachisaur, therizinosaur, oviraptorosaur and protoceratopsids on the cover; much better views of the oviraptorosaurs on the inside, along with Nyctosaurus, some hadrosaurs and — I dunno, maybe scansoriopterygids? Yes, pretty sure those are scansoriopterygids imagined as bird-monkeys. Love love love the showy plumes on those oviraptorosaurs!